Is J.C. Penney Finally Showing Flickers of Life? The ailing retailer’s holiday update stumbles over a very low bar. Shares of J.C. Penney (NYSE:JCP) surged 11% on Jan. 9 after the struggling retailer issued a holiday sales update. 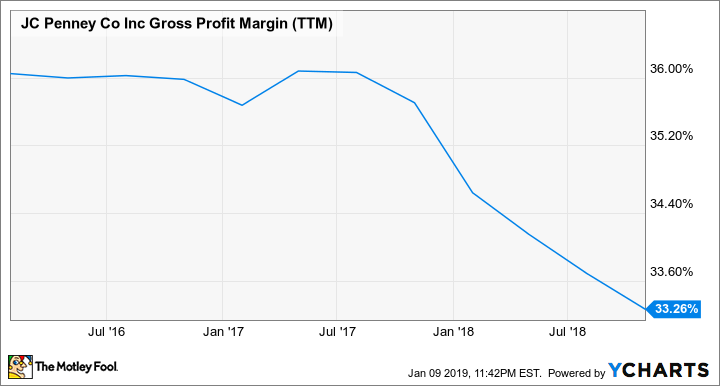 The company stated that its comparable-store sales for the nine-week period that ended on Jan. 5 fell 3.5% on a shifted basis (which aligns the fiscal and calendar years) and 5.4% on an unshifted basis. J.C. Penney also reaffirmed its goals for generating positive free cash flow (FCF) in fiscal 2018, reducing its inventory by more than 8%, and finishing the year with more than $2 billion in liquidity. The company also stated that it will close three stores "as part of an ongoing evaluation of its store portfolio" over the next few months as it explores the monetization of "beneficial" real estate assets. J.C. Penney plans to reveal additional details when it reports its fourth-quarter earnings on Feb. 28. The company's holiday update wasn't surprising, so why did it spark a rally? J.C. Penney was crushed between e-tailers, superstores, and fast-fashion retailers over the past decade. An ill-advised turnaround effort by former CEO Ron Johnson alienated the retailer's core customers, and his ineffectual successors failed to win them back. A string of executives -- including CEO Marvin Ellison and CFO Jeffrey Davis -- also abruptly resigned over the past year. A glimmer of hope appeared when J.C. Penney hired Jill Soltau, the former CEO of crafts and fabric retailer Jo-Ann Stores, as its new chief executive -- but Soltau faces a tough uphill battle. Source: J.C. Penney quarterly reports. *(4.5%) on a shifted basis. However, J.C. Penney's 5.4% comps decline during the holiday period notably wasn't worse than its decline in the third quarter, and its 3.5% decline on a shifted basis actually marked an improvement from its 4.5% drop in the third quarter. But without other crucial information -- like store traffic, transactions, and margins -- we can't tell how much of that comps growth was fueled by promotions. Soltau hasn't said much about her turnaround plans for J.C. Penney, but she's made clearing out the retailer's excess inventory a top priority. An 8% decline in inventory for the year is encouraging, but it also suggests that its "improvement" in shifted comps during the holidays was driven by markdowns -- which will further dent its gross margins. Unfortunately, J.C. Penney's holiday results still look poor relative to those of the rest of the industry. Mastercard's (NYSE:MA) SpendingPulse recently reported that U.S. holiday sales rose 5.1% annually to $850 billion this year, marking the industry's strongest growth in six years. However, Mastercard also noted that department stores finished the season with a 1.3% decline in sales -- partly due to store closures. J.C. Penney's inability to match those growth rates indicates that it remains a "bottom-of-the-barrel" retailer. By comparison, Macy's (NYSE:M) -- which posted positive comps growth over the past four quarters -- expects its comps to rise 2.0% for the full year. One of J.C. Penney's most pressing concerns is its $4.2 billion in long-term debt. The bears think that debt load will break the company, which needs to pay off more than $2 billion of it in 2023. Meanwhile, its cash and equivalents fell 9% annually to $168 million last quarter, and its FCF remained in negative territory over the past 12 months. 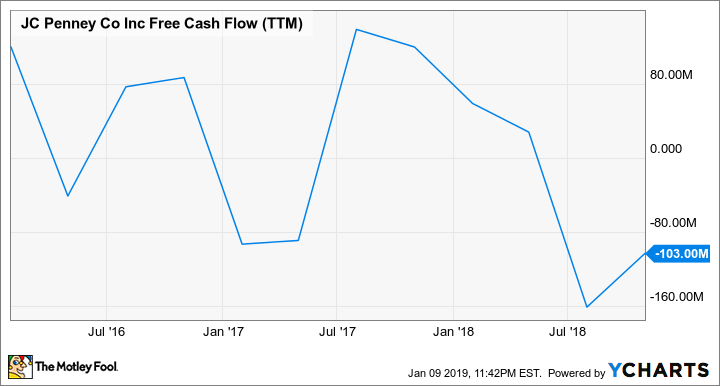 JCP Free Cash Flow (TTM) data by YCharts. That's why J.C. Penney is trying to boost its FCF back into positive territory by liquidating its inventory, closing stores, and possibly selling some properties -- and its holiday update indicates that plan remains on track. J.C. Penney's rally wasn't caused by the bears suddenly turning bullish on the stock. Instead, I think it was likely a short squeeze complemented by a marketwide rally, since more than 40% of its float was still being shorted at the end of December. J.C. Penney's rally might keep it above the $1 mark, but it probably won't lead to any long-term gains. Therefore, investors should steer clear of this stock until the company's management offers more concrete plans for a turnaround beyond liquidating inventories and closing stores.